AHHH, my sweet little gals. So giggly, cuddly, and lovable. So much, that it’s expressed through all the spit-up, slobber and miscellaneous gunk I wear all day…sometimes multiple days in a row. YOU KNOW (you’ve done it too), those days when you shower (maybe) and put the same clothes back on because you thought they were clean and then you just keep them on through the next day until you look into the mirror backwards while making faces with your baby and see a huge blotch of dried spit up on your shoulder going down your back. You take a quick whiff and you can smell the spit-up, not exactly sure why you couldn’t smell it before. Oh, the glory of motherhood. So, you change your shirt only to later discover that the new shirt you’re wearing is also covered in dried spit up. Finally, you carefully look over a ‘clean’ shirt and feel you’ve made a great choice. You proudly pick up a babe for some snuggle time and she welcomes you with an open mouth full of spit-up and this time it goes down the front of your shirt and into your bra. Three strikes you’re out?! Well, I thought so until a 4th change of clothes ended up immediately in the washer after picking up my other babe who ‘exploded’ with happiness all over my hip – and this was not spit up. I often wonder why their isn’t a bib for mamas. I would even consider wearing a hazmat suit, but I’m sure that would terrify my innocent little munchkins. 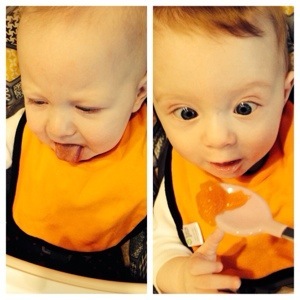 Why do they even make bibs for babies? Even when they have bibs on, their food ends up all over the rest of their clothes and mine. I would like a very large bib, maybe even in the form of a dress or or jumpsuit. Really. Lately, I don’t leave the house much anyway. And when I do, I would just like to take off my bib and confidently present my clean self to the world. I promise, the world would never know what sticky/gooey/slobbery place I came from. Yes, I’m proud of where I came from but I would prefer to leave dried spit up, chunks of food and the other toxic baby substances (that find their way out of a diaper), at home. At the end of the day, we love our messy little ones. I would probably roll around in their spit-up if it meant making them happy, hearing them giggle, cuddling with them just a little longer. It would just be a little nicer to do it while protected… in a bib for mama. « .:5:. a few requests, please!